Takumi is the name given to Japanese master craftsmen.They devote a lifetime to their craft. Endless repetition, no shortcuts. Developing almost super human abilities. But how do we honor and preserve human craft, human ingenuity, timeless creative processes; as simultaneously we design machines to act more precisely and faster than humans ever can? How do we take the long road to excellence in a world clamoring for shortcuts? 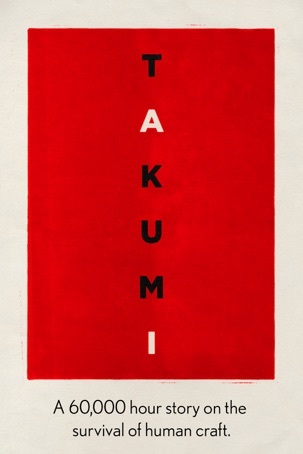 This film will be a visually-stunning, character-driven portrait of the unique philosophy of Takumi in today’s modern world. Takumi.The 60,000 hour story of human craft.